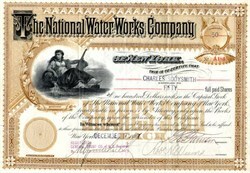 Beautifully engraved uncnacelled stock certificate from the National Water Works Company issued in 1889. 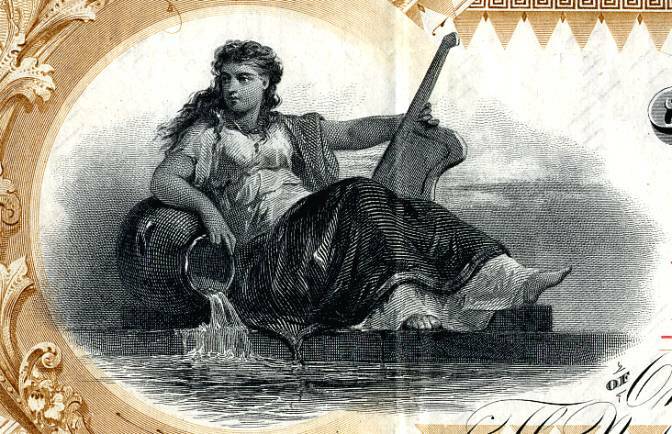 This historic document was printed by the American Banknote Company and has an ornate border around it with a vignette of an allegorical woman holding an overturned water vase and guitar-like instrument. This item has the hand signatures of the Company�s President, and Secretary, and is over 127 years old. The company reorganized as Delaware Valley Utilities in 1931 and subsuquestly merged into North Eastern Water Company in 1944. In 1962, the company once again merged with American Water Works Company. American Water Works was founded in 1886 as the American Water Works & Guarantee Company. By the time it changed its name to American Water Works & Electric (AWW&E) in 1914, it had joined the ranks of the giant US utility holding companies and owned a bevy of unrelated electric, gas, and water companies, as well as California real estate. Meanwhile, as AWW&E was growing, an eighth-grade dropout named John Ware was buying up small water companies around the country, including Northeastern Water. After the 1929 stock market crash brought many utility behemoths to their knees, the federal government moved to protect consumers by passing the Public Utility Holding Company Act of 1935 to break up and regulate the powerful trusts that controlled the nation's electric and gas utilities. AWW&E tried to fight the Act in the courts (but wisely filed a reorganization plan in 1937, becoming the first utility holding company to do so, and divested its California land holdings). The lawsuit was settled in 1946 when the Supreme Court upheld the Act, and the company put its electric utilities and its highly profitable water properties up for sale as American Water Works Co., Inc.
Ware submitted the only bid in 1947, and his Northeastern Water paid $13 million for a 51% share of a company that had assets of more than $180 million. The company went public that year. Ware moved the firm's offices several times between New York and New Jersey before settling in Philadelphia in 1955. A few years after buying American Water Works, Ware spun off its electric holdings. In 1960 Ware retired as chairman and was replaced by his son, John Ware III. Three years later, Northeastern Water and American Water Works merged their operations, and in 1976 the company moved to Voorhees, New Jersey. The federal government, which had started regulating water quality in 1974, continued to pass tougher and tougher water laws -- making it harder for smaller players to survive. After decades of buying and selling small water companies, American Water Works entered a period of consolidation and integration that helped it survive the economic downturn of the late 1960s and 1970s. By 1984, the year John Ware III retired, American had 33 operating units (it had acquired more than 150 companies since the 1930s). Ware was replaced by Philadelphia banker Sam Ballam. In 1987 Marilyn Ware Lewis, daughter of John Ware III, became chairman, bringing the company back into the family's purview. In 1998 James Barr took over as CEO. Barr, who had started at American Water Works as a 20-year-old records clerk, recognized opportunity in new federal water-quality rules that forced municipalities to upgrade their old and ailing water systems. Lacking the resources to make all the repairs themselves, many munis were turning to the private sector. That year American Water Works began scouting for acquisitions and completed 22. The next year the company bought National Enterprises, a family-owned water utility operator that served 1.5 million customers in Missouri, Indiana, Illinois, and New York. The $700 million acquisition was the largest in the history of the US water utility industry. American Water Works topped it, however, by agreeing to acquire the water and wastewater businesses of Citizens Utilities (which became Citizens Communications in 2000) in an $835 million deal that would give the company another 300,000 customers. Also in 1999 the company agreed to buy California water utility SJW (216,000 customers) for about $480 million.